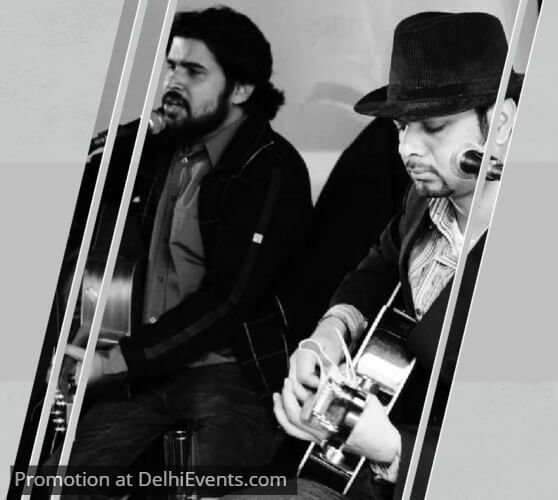 The duo consisting of Diyatom Deb Music and Sushant Thakur, has been playing together in the Delhi based band ‘Big Bang Blues’ for some time now. Recently they both decided to come together to form an ‘all-acoustic’ act playing blues, country, classic rock-retro covers. The musicians with their wide experience playing for the Big Bang Blues have already played at venues like The Piano Man, Bluefrog (Mumbai and Delhi), Hardrock Cafe, High Spirits and Bflat. When it comes to belting out the blues there are few good men in Delhi who can sing the way Diyatom Deb can. A deep and big voice, he makes a very good impression in the very first few seconds as the audience tunes in their ears. He sings country and retro classics with equal ease. He has recently joined the Delhi based band Big Bang Blues as lead vocalist. Sushant’s roaring electric solos takes one back to the 60’s, which is evident in his on-stage look. His signature Black Hat and Bell Bottoms has created a new trend among the young musicians of Delhi. His appearance does complete justice to his long list of influences which includes Led Zeppelin, Hendrix, Allman Brothers Band, Stevie Ray Vaughn and many others.